With the latest developments happening in our country, there seems to be a greater need for compassion. Like the motto of the TOS, “A union of those who love, in the service of all that suffers,” the Charter for Compassion calls upon all of us to live by certain principles that promote a compassionate lifestyle. Through our thoughts, words, and actions, we can change our environment one person at a time. But it must begin with ourselves first. Read more about Has Your Community Signed the Charter for Compassion? In 2005, Quest Books published one of its most profound books, War and the Soul by Edward Tick. While this book centers on the topic of soldiers and soul loss after combat, the message is viable for any population and anyone who has dealt with extreme violence and trauma. No one likes to think about children being mistreated in any way; however, child abuse and neglect are rampant in our society. It is estimated that nationally one in ten children will be sexually abused before their 18th birthday, and 90% of those children will know their abuser. The Children’s Advocacy Center—Hope House is an independent, non-profit organization dedicated to ending the cycle of child abuse in Covington, LA. Hope House provides a path to recovery and a bridge to justice for child victims of abuse. 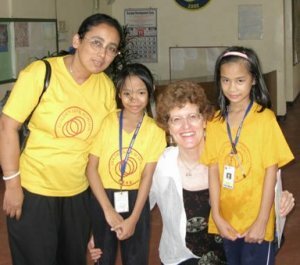 Those interested in reading about TOS-founded Golden Link School in the Philippines will want to download or view the school's beautiful leaflet (488K, Adobe Acrobat Reader or equivalent required). The following information is from Educational and Welfare Activities section of the Adyar TS website. Listed are all the schools that the US Federations, Lodges and Study Groups can contribute to. Located in the southern part of South Dakota, the Rosebud Reservation is in great need of support.